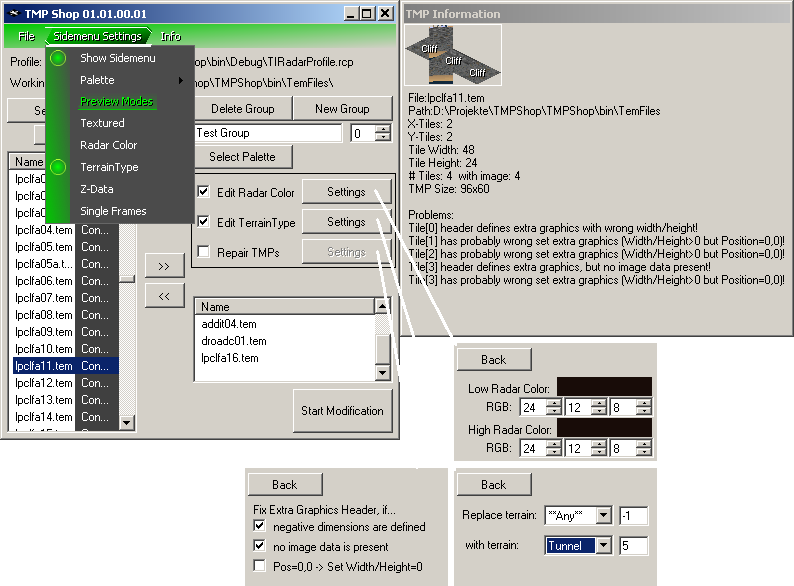 The TMP Shop is a tool which can edit multiple aspects of TMP files like the radar color and terrain type of an "unlimited" amount of tmp files in one single operation, which is especially useful for big mod projects like TI, where editing thousands of tmp files one by one is impossible. Supports TS and RA2 TMP format. System Requirements: .NET 3.5 or newer installed. The TMPshop.ini is automatically saved when you close the program and contains infos about the last used profile, the window position and size. 1. Choose the folder that has all the tmp files with the "Select Directory" Button. 2. Create groups which will then contain the tmp files that should be edited in the same way. 4. Select the tmp files on the left that you wish to assign to the current group and press the >> button. 5. Once the groups got the files assigned, press "Start Modification"
The [File] menu allows to save, load and create new TMPshop profiles (ini files with rcp extension). A profile contains all the data about the used groups, the editing settings and the files belonging to each group. The program can not give every single 1x1 tile in a big tmp a different radar color. It will give every one the same color defined in the group. That shouldn't be a problem though, since the radar needs to be made with less fancy colors anyway. This allows to change a terrain type into another one. Choose **Any** to give every tile the same terrain type. Some other tools seem to set the header for the extra graphics wrong, when they create new TMP files. This tool allows you to fix some wrong set header. You can press shift+x to show the tmp info sidemenu. Each single 1x1 tile in the preview shows in the upper half the high radar color and in the lower half the low radar color. You can click on the image to get a color info with the exact RGB value. Note: This is still a beta and I'm not 100% sure if it works 100% perfect. So do a backup of the tmp files!!! To view the tmp textured with the right palette, you have to place the palette in the same directory as the tmp files. Then click on the [Palette] Button and choose the palette file in the filelist. Each group can have a different palette. 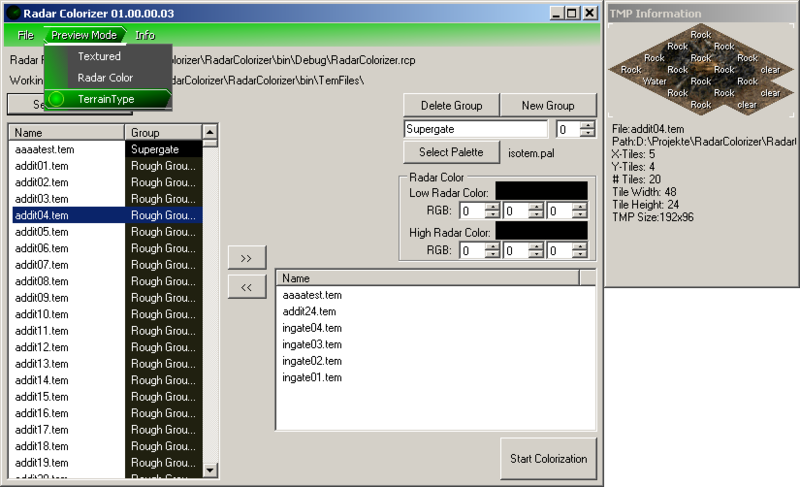 -"Radar Colorizer" renamed to "TMP Shop"
-(update) "Edit Tile Header" Option added in main menu. It sets the "Damaged Art" value for all tiles of each file in the group. -(update) in "Single Frames" the Sidemenu shows a new entry in the info label called "BitDataBlock" which is the one that is actually used for the bit flags. Nice work, going to try this out as soon as I have some time. After some serious tests with some more files, I've found already a few bugs. In one case it even made the tmp corrupt. So this version is really not reliable and shouldn't be used! looks good, I've got 1,800 cliff tiles I need to recolour so I have high hopes for this protect. Thats usefull. It will save alot time for me too. Woo! Congrats on finishing this. btw, those who have/mod RA2, please upload some tmp files so i can test these too. It would be useful to have many different types of them (one or two tmp-files of each type are enough). You and I, kings of mass TMP production. I'm sure if you put D-Day and TI together you get around 20,000 TMP files if not more. Great work, LKO. This'll be a great step towards making a more useful radar interface. Ooh, nice. This is pretty much a .tmp version of what Icy and I made for SHP files, isn't it? LKO I'll send you the marble madness tiles I made for D-day's new cliffs, they have pretty much every tile type you asked for there. Can you show me a link? I don't think I've seen your tool before. But it sounds like they are similar. Once the horrible tmp format is finish, i could imagine adding SHP support too. After all this format is much better documented in the SHP Builder code. So the game does not use RadarColor? Considering that XCC Radar recolorizer modified every tmp to darken itself, I really doubt. I couldn't get that tag working on my own neither. You're talking about the LowRadarColor and HighRadarColor values in temperat.ini and snow.ini? TS indeed ignores those and gets the radar colors directly from the TMPs themselves. As for the SHPs, IIRC you already know that the game ignores the radar colors specified for overlay in rules.ini. I've found the bug and fixed it. Attached is an example of the TI radar. I'll fix and add a few last things, before I upload the new first final version tomorrow. @Mig Eater: All your crazy/extraordinary RA2 TMP files seem to work fine too. However i couldn't test them ingame. I wish there still was a way to at least double the Radar screen size. But test 2 is already much better than the original. Ground color 1, cliffs color 2, water color 3 and I'm done. Can't wait to try the proper version. What's wrong with the original radar colors though? The problem is the bright terrain in the radar. Thus the contrast between player colors and the terrain color is too low. With a darker, less detailed terrain, you can make out much better the tiny 1 pixel big units on the radar. Best example, see the green player on the picture above (second top right location). On the normal one it is almost invisible, while clearly visible on Test2. The brown player below also only became visible in Test 2.
btw, does anyone know if the game compares the terrain files between each player? It might be a nice feature to give each player the opportunity to color his radar as he wishes. It could be done before the start of the game, since it takes only a few seconds. So some can go with a fancy colorful radar and others use a simplified/minimalistic one. It might be also worth to give every civilian structure and unit RadarInvisible=yes, so the bright white pixel disappear too. I don't think the game checks for any graphic files at all, just the text files needed to run the game. You can safely play it with different voxels and shps on each machine, as long as their entries are the same, so why not terrain? AFAIK the game only compares ini files & maps, using your own gfx online/LAN is fine. The TMP files are more than just graphics however; they also contain properties for height and what terrain type every cell is, which tells the game how fast a unit can move on those cells or whether those cells are impassable. So with that in mind, it would make sense for the game to check for it, so that certain terrain won't be impassable for one player and not for another (although that could also simply cause a desync when when a unit moves on such a cell). true, but comparing thousands of files between 8 players is one huge operation too. On a different note: Does anyone know if the color for the Neutral/Special house can be changed? It would be nice to give the civilians a dark grey instead. Just edit the values after LightGrey= under [Colors]. wow, i played already quite a few games but never noticed the different radar color. Of course i noticed the dark gold on the remap, but never checked the radar. 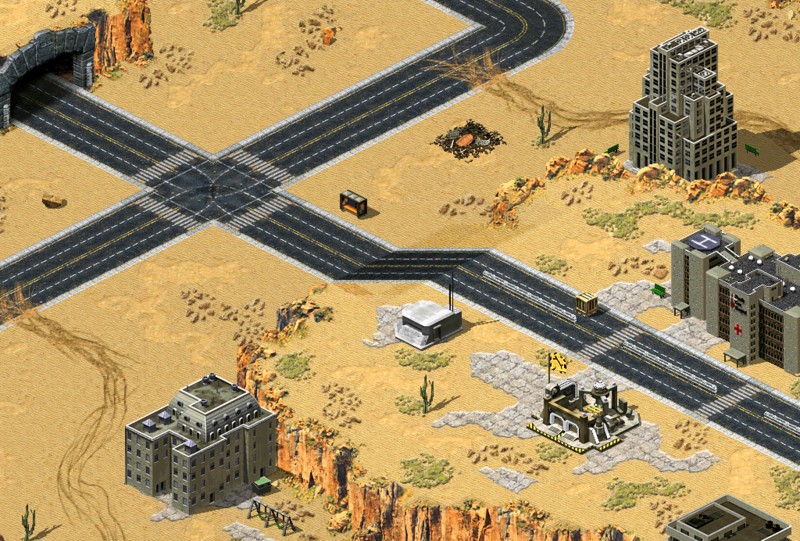 I initially changed it especially for the "building terrain" (I intentionally picked a color that was was exactly in between the temperate and desert clear tiles, so that it'd look good on the radar when playing on maps of both theaters) and when I switched to real terrain this was actually no longer necessary, but I never changed the civilian remap color back because I thought the current color was actually a lot more fitting (especially with Metalic present as a selectable color in multiplayer). Final Version 1.2 is done. Download link and description in the first post updated. How do I get rid of trees and rocks from the minimap.. or at least paint them in the same color ground has? Colorizer doesn't work, RadarInvisible on overlay rocks doesn't work, RadarColor doesn't work. EDIT: Okay, nevermind the RadarColor and rocks thing. This leaves the trees. @Speeder: this tool can only modify tmp files. Trees, rocks and other terrain stuff are normal SHPs. SHPs can have a radarcolor too. See Bittah's post above. btw, nice radar you have there. Can you show a picture how it was before the conversion? 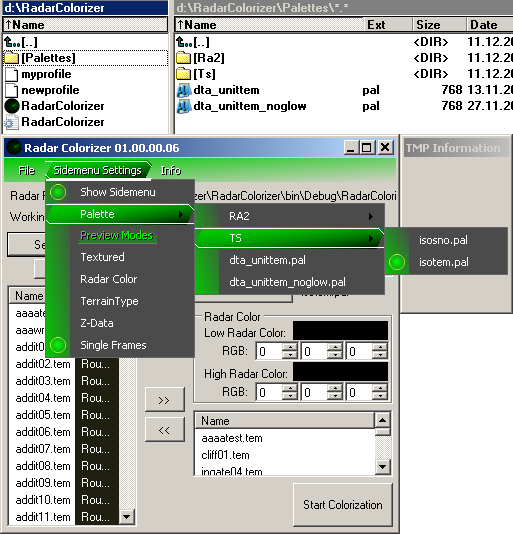 Pretty sure that it's impossible to alter the radar color of TerrainTypes and ore overlays in RA2/YR. It does not use the values in the SHP files themselves nor RadarColor= from INI. All right, I made rocks the color of ground with RadarColor. Trees remain unresolved.. I also brightened all colors a bit and added one more group for entrances, bridges and large slopes (for some reason, might change this one back to green though). Desert might not be the best comparison example for this one, but I think it will work better with terrains like snow and urban. 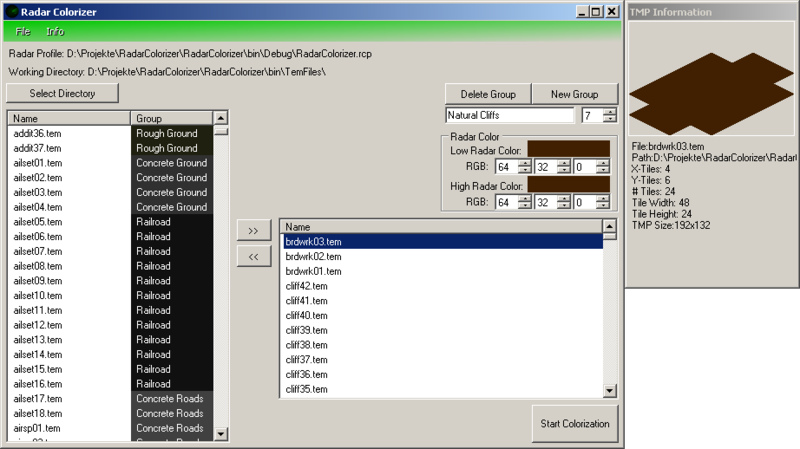 This color set allows me to use few remap colors safely. The large slopes look great on that IMO. I just don't think you should use green for desert terrain. My attempt at a more... radary radar. I will most likely use green for all terrains. There are shades of brown I use for house colors and they don't look good on other browns. They all look sharp on this green though. oh, i just realized speeder is using it successful on RA2 tmp files. Nice to see it working with these tmp as well. So, no way of changing the trees radar color? Tried a few things already and nothing worked. Which color is used? Are they black or do they have a certain color? If they use a color, does it look like the shown object? If yes, what happens if you have a red terraintype? Will it show red on the radar as well? Back to the picture I showed earlier. See those single dots in a color similar to ore? Those are trees. You mean those few scattered pixel? Are there only 20 trees on this map? What happens if you have bright red Ore? Will it show a red radar color too or still keep this pudding-yellow? Maybe it's using one of the many color keys like LightLime or LightPeach. Yeah, not many trees in that map. Gotta check that ore thing later, although given that they're overlays + rocks being overlays too and being affected by RadarColor..
Then change the trees into destroyable rocks. It's surely just a key like IsARock=true which enables the radarcolor. The ore color stays the same no matter what. I have different colored (silvery blue, for an example) ores in my mod and it still stays light yellow/brown on radar. It does not use any color scheme from INI nor RadarColor= seems to get used under any circumstances. Hardcoded behaviour attached to Tiberium=yes overlays I bet. Adding IsARock=yes to ore overlays does nothing but make the ore unharvestable. 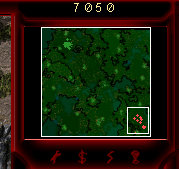 Would need to edit every goddamn map manually to change all the trees from TerrainTypes to Overlays. Not a fun job, certainly. I thought he meant TerrainType rocks. Since this tool already appears to be capable of showing what ground type every cell uses, would it be doable to also add a filter which allows you to only show TMP files that include cells with a certain ground type? Still, with such I function you'd be able to instantly find TMPs where one or more cells use a wrong ground type (like in the image in this topic's first post) and in some cases you'd also be able to instantly fix it for multiple files. Another situation where this would be very helpful is if you decide to use a certain ground type for a specific purpose and then need to remove that ground type from all tiles that currently still make use of it. Seeing many cliffs using wrong terraintypes, I thought it would surely help to be able to set them all to "rock" in one operation. Haven't thought about a "replace" and planned more a simple "set" function for the terraintype, but a replace is definitely possible and now on my todo list too.